PID in Action: Happy New Year!!!! 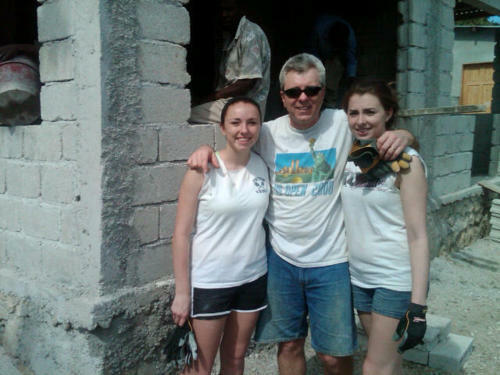 Martha’s husband Ken is in Haiti for the first time w/ both of his girls, Allie and Megan. Family that works together, stays together. After 10 yrs of the Murray family coming to Haiti on various trips, they finally are all here together. Yeah!! Robin and her twin boys. 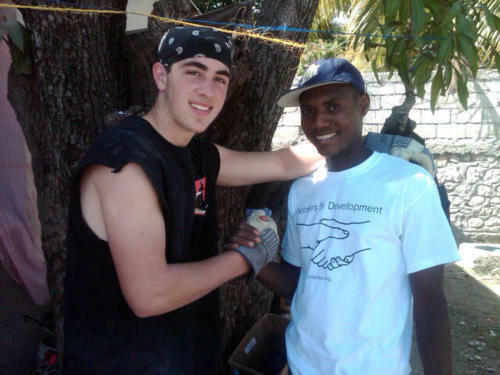 Max and his Haitian twin, Max, posed during the construction break. Max modeled his PID shirt which is available for sale for $10. Nice shirt, Max! We are sure everybody will want one now. 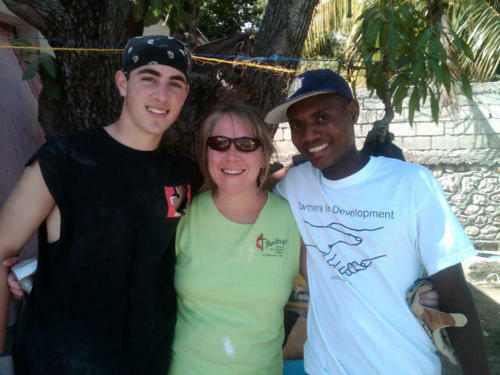 We are pleased to report that the last of our team has safely arrived in Haiti. Sarah and Anna from Lee, NH (also victims of the blizzard0 finally arrived this morning. Welcome! Jason has, until today, worked with Dr. Sem. He was not ready for what he has witnessed in the clinic here in Haiti. He was quite surprised at the degree of illness being treated at a community clinic. There were many injuries, resulting from the earthquake, which were untreated for almost a year. For instance, a diabetic old man, who came with edema (swelling) on his knee, had to have his old wound cleaned & drained. It had been festering for almost a year. Showty (pronounced Shorty, we think) has been entertaining the team with his singing and his sparkling personality. He is one of the security people who watch over the clinic, but he adds much to the atmosphere here. Besides him, we have been entertained by Amar the wall climber, Maxwell the stone juggler and Maxim the gymnast. Yes coming to Haiti is like being at the circus. The clinic did not open today so Thuy, who has been working in the clinic, tried her hand at physical labor at the construction site. She had a lot of fun, but is more determined than ever about Medical school. Finally, our team had it’s first ride in a tap-tap (a pickup truck with bench seating, the main method of transport here) today so that we could take a closer look at Port au Prince. The city is stilll in a state of devastation with crumbling buildings, including the Presidential Palace as monuments to the nearly one year old quake. Every patch of park is covered with tents, shacks and a million homeless people. We are proud of our contribution, but Haiti needs everybody’s help and prayer.